Bake 20-25 minutes or until set and crusty looking around the edges. Top with marshmallows; flatten marshmallows with the tips of your fingers. Dust additional cocoa powder on top, if desired. 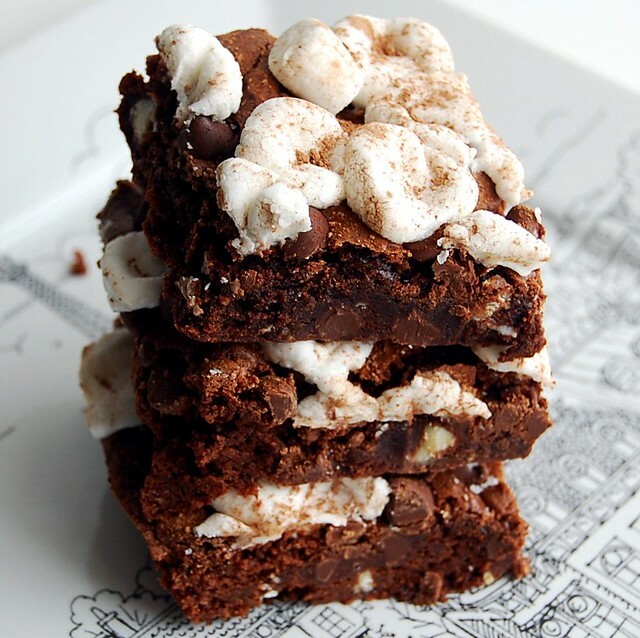 48 comments on "Hot Chocolate Brownies"
What an awesome recipe! These look SO good! 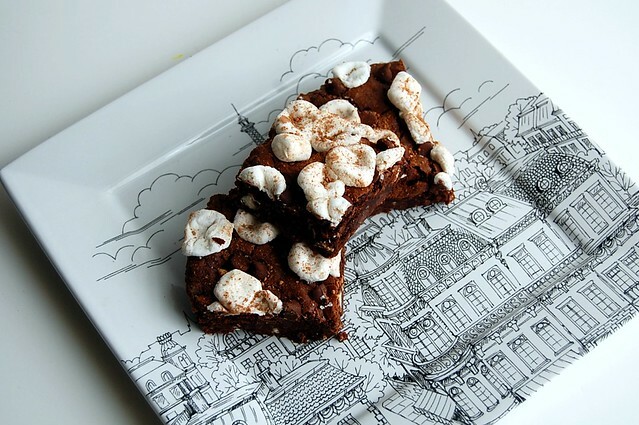 I really like the plate... and the brownies of course! Where is the awesome plate from? Angicoock, don't go to sleep! Vanessa, thanks! I think my mom might have bought it at Marshalls. It was a Christmas gift last year. Hot yoga sounds like a hot mess of fun! Awesome! I made hot chocolate cookies for my students this Christmas and they were a HUGE hit ... I am sure these would be too!! I just might have to bake them a batch for Easter. These brownies look picture perfect. I especially love the toasted mini marshmallows on top. They look awesome. They look delicious and I'm a big fan of mini marshmallows too! Mmm I need to make some brownies now. I tried a few hot yoga classes, and you're right, it really does make you feel awesome afterwards! But, since it's nice and warm in there, your body allows you to stretch more, and the next day I am always so, so sore! I've heard people say it's not as safe as regular yoga cause you could hurt yourself, but I think it is totally fine as long as you know not to push yourself too much! These brownies look delicious! I could totally curl up with them in front of a fire on a wintry night! I have had many of my friends talk about the hot yoga classes....haven't seen them locally yet. Wow these brownies looks heavenly!!! 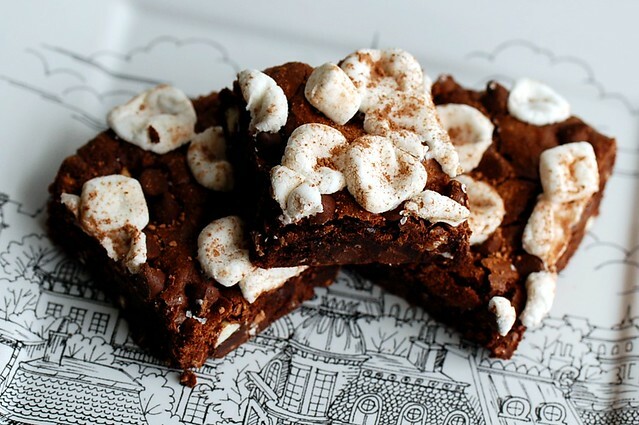 Hot chocolate brownies = brilliant! Love the pics!! I think a hot yoga class would be fun! I have been wanting to take a yoga class so now i'm going to have to see if there are hot yoga classes where I live! The only yoga I've ever done has been on the wii! Your brownies look like the perfect treat for after a workout.....or for anytime! Oh Emily beautiful brownies! I love the plate, where did you get it from? The brownies look amazing!! And simple to make! Yoga! Congrats! I have been a yoga teacher for 10 years. I love reading about people who try yoga for the 1st time and love it! My boss does hot yoga and the girl is ripped! wonderful site and decadent recipe! agreed with others on the hot yoga front. i'm recovering from a knee injury (and before that, a back injury). bikram is SO tough in the process but the effects are absolutely remarkable... plus they allow us to munch on plenty of the chocolate goodness posted above! that is a very cute plate! 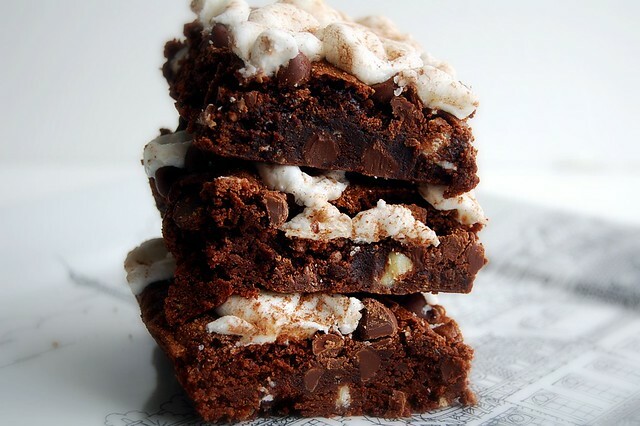 Those look completely decadent and totally delicious...just the way brownies should look!! I'd take a hot yoga class if they offered it,and I'd take two of these brownies and then a Zoomba class. I would kill for one of those. And pay big bucks. the hot yoga- not so much! i hate the heat, just the thought of 105 degrees makes me want to pass out! but good luck to you with it. I have always been curious by hot yoga. I'm glad you kept up in class and followed up with these brownies. Yum! Hot yoga class has always intrigued me! I always wonder how it will be like sweating an EXTRA bucketful while doing yoga. Must take lots of concentration doesn't it? Can't wait to see what you have cooked up for us (ha ha) in your recipe tests. These brownies look fantastic! Love the addition of the little marshmallows. 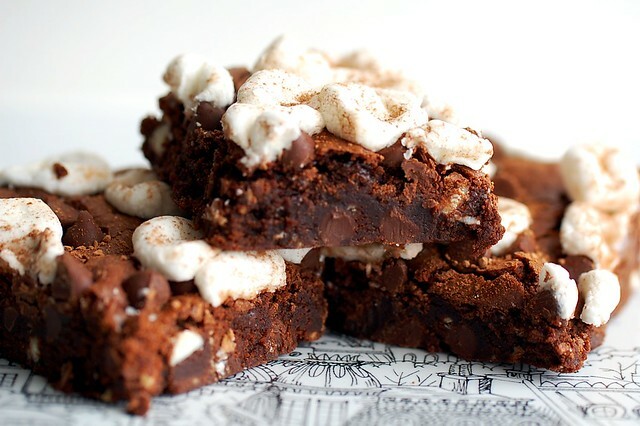 These pictures have convinced me that I need brownies in my life ASAP! I've done hot yoga a few times. Like you, I'd only done yoga before from some DVD's and I could do a lot of the poses, but not all. I was amazed at people who could do a headstand... hopefully I'll be able to do that one day. I love the way it makes my skin feel too. It's definitely a killer workout. My first couple of times I was sore for days afterwards. The only reason I don't go more often is because it's a little pricey. Your yoga sounds interesting. I haven't done yoga as a class...just cross training and zumba. Have you heard of zumba? I think you would like that :) And these brownies. Yum! I think I need to make them for this weekend. these would be a sure hit at my house! My kids LOVE hot cocoa...and who doesn't love brownies? great combo! Erica, I think you're right. We took a lot of breaks so it wasn't that bad. Joanne, the class is only $5, which seems reasonable to me. Shannon, a headstand would be nuts! I don't think I could ever do that. I'm curious to see if it did really have an effect on my skin. Hi Brittany! Thanks for stopping by! Holly, I would love to try zumba. They offered that at the gym I went to for a while. These looks gooey and chocolatey and sooo yummy! Great pics..my mouth is watering. marshmallows improve everything, that's my belief. I love your blog, especially how you create most of the recipes while most bloggers take them from other blog/cookbooks...beautiful pictures too! These really do taste like hot chocolate! Made them this morning along with your vanilla ice cream - YUM! We are having friends over tonight for dinner & I think they will love dessert :) Thanks for posting! Oh, quick question - how do you get the brownies to slice so clean? Mine were a bit crumbly upon slicing. Hi Kristin, I'm so glad you liked them! I line my baking dish with foil and coat it with cooking spray. After the brownies have cooled, I lift out the foil and transport the brownies to a cutting board and slice into squares. Sometimes I chill brownies/bars in the the refrigerator too, because that helps with clean slicing. Thanks, Emily! I will give that a try next time. could I sub the unsweetened cocoa powder with actual hot cocoa powder, and decrease the amount of sugar? I absolutely love these brownies...I remember finding this recipe a while ago, making it and loving it so much I ended up doubling it the next weekend. I just changed the toppings a bit (using a mixed bag of milk choco / peanut butter chips) but I love this recipe so much that when I heard my best friend wanted brownies for her birthday, I knew exactly what to make! It took a bit of googling to find this page again but I'm bookmarking for sure this time, for whenever I get the brownie craving again!